The peso was up nearly 1% on Friday. The US and Mexico have reportedly made progress on NAFTA. The Mexican peso rose nearly 1% on Friday after reports that the US and Mexico were nearing a preliminary breakthrough on NAFTA, which would bring the two countries and Canada closer to resolving back-and-forth trade negotiations that have dragged on for more than a year. Reuters reports that disputes about auto rules have pushed talks into next week, but the US and Mexico are seemingly closer to resolving other issues. The two countries earlier this month entered a round of bilateral negotiations for modernising the 2015 trade deal, which President Donald Trump has threatened to pull out of. The apparent progress comes as a relief for those who feared the July election of leftist Mexican President Andres Manuel Lopez Obrador, who has been a tough critic of Trump, could ramp up tensions between the US and Mexico. “With election uncertainty past in Mexico, prospects for a NAFTA deal and speculation over presidential appointments matter most,” Citi strategists led by Steven Wieting wrote in a note Friday. Also on Friday, data showed Mexico’s economy stalled in the second quarter as increasing activity in the services sector was offset by slowing industrial and agricultural production. 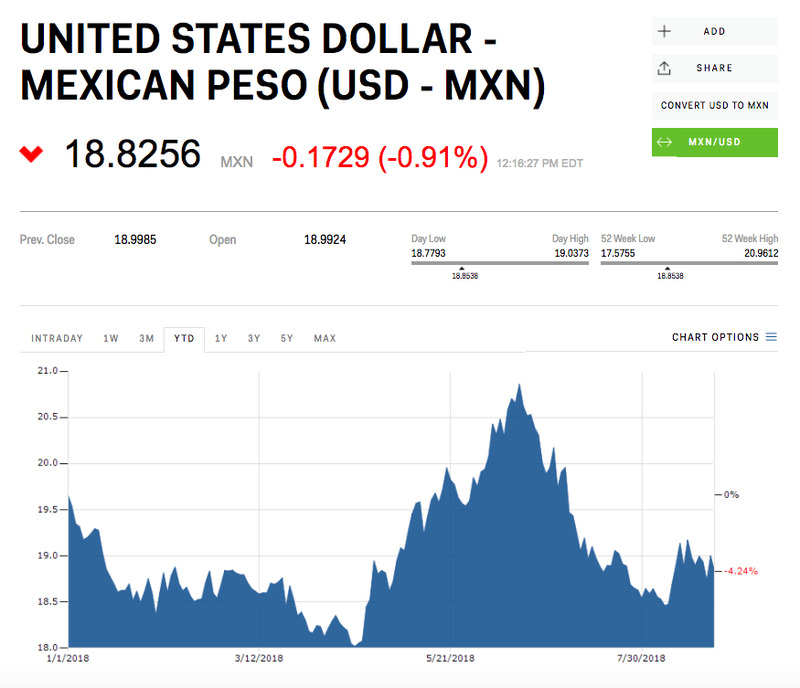 Gross domestic product in Mexico declined 0.2% from the quarter before, the the national statistics agency said Friday, compared with expectations for a 0.1% contraction. Mexico’s current account deficit narrowed in the second quarter to $US3.882 billion, the central bank said in a separate report. The peso is up 4.25% against the dollar this year.